If you want to learn to speak Spanish, you’ve come to the right place. If you’re currently taking Spanish classes and are looking for some extra help, there are three distinct areas that you will need to work on. 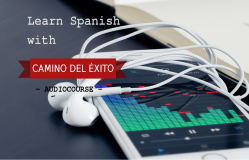 Learn Spanish as it is actually spoken with our audio course. Usable online or on the go! I teach at a school with a significant Latino population and the Camino del éxito program has empowered me to communicate quite well with parents. This is both satisfying for me and reassuring for them. Through regular listening and practicing (often on my way to and from school) I grow more assured of my fluency. The online program is terrific because it provides a solid way of mastering concepts through an abundance of practice. This program was well thought-out. And because of that, it works! I work in the medical field and it's unbelievable how many people come into the emergency room that don't speak English. I have a 40 mile drive to work and I take that time to listen to the Camino del exito cds. In my downtime, (I work nights) I log on to studyspanish.com and do exercises. We have a strict Internet policy at work but my supervisor gave me permission because she knows learning Spanish enables me to do a better job explaining procedures to the patients.